ATTRACTION/ENTERTAINMENT; Reconstruction of c. 1875 small crossroads community; seasonal. ·Cherokee Court House 458-9440 Downtown Tahlequah on Muskogee Ave.
· Cherokee Heritage Center & Historical Society -Trail of Tears Drama 456-6007 One mile South of Tahlequah, at the stop light on Willis Road, turn East going through a 4 way stop. At 1 ½ miles, road will turn South. Continue 1/8 mile Center is on East of road. To visit the Murrell Home, continue South on this road ¾ mile and it will run straight into it. MUSEUM/LIBRARY; SOUVENIRS; ATTRACTION/ENTERTAINMENT; VISITOR INFORMATION; HANDICAP ACCESS; PUBLIC RESTROOMS; PUBLIC TELEPHONE; Outdoor theatre at Tsa-La-Gi; Nat'l Museum, Ancient Village; seasonal. VISITOR INFORMATION; HANDICAP ACCESS; PUBLIC RESTROOMS. MUNICIPAL/TRIBAL GOVERNMENT; SOUVENIRS; Cherokee Tribe headquarters; tours available upon request; gift shop. Downtown Tahlequah at the Southeast corner of the existing Cherokee Court House Square. HISTORICAL MARKER/LANDMARK; Assassinated for signing treaty removing Cherokees from Georgia. HISTORICAL MARKER/LANDMARK; c. 1887, originally Indian University, now NSU Center/Tribal Studies. HISTORICAL MARKER/LANDMARK; HANDICAP ACCESS; PUBLIC RESTROOMS; c.1887 home, now center for NSU Sequoyah Institute. MUSEUM/LIBRARY; Pearl Hunnicutt antique & modern doll collections. LAKE/RIVER/LAKE USE AREA; HOSPITAL/FIRST AID/PHARMACY; OK's most popular canoe trail, starts in Boston Mountains, AR. MUSEUM/LIBRARY; Invertebrate Museum in Science Building. MUSEUM/LIBRARY;&Mac246;HANDICAP ACCESS; PUBLIC TELEPHONE; University library w/Cherokee archives section. 456-2751 South of Tahlequah 2 ½ miles to the Hwy. 62 and 82 Junction go South 1/8 mile on Hwy. 82. Turn East at the Elks Club sign and go 1 ½ mile. Murrell Home is on the south side of road. MUSEUM/LIBRARY; OUTDOOR RECREATION; HANDICAP ACCESS; PUBLIC RESTROOMS; Shows life of affluent Cherokees in early Tahlequah; seasonal; trail less than mile, designed for elderly, handicapped. HISTORICAL MARKER/LANDMARK; Est. 1880 as Indian Territory. COLLEGE/UNIVERSITY; Wide range degree programs & OK's only optometry college. ATTRACTION/ENTERTAINMENT; HANDICAP ACCESS; PUBLIC RESTROOMS; Jazz, Dixieland & Country music. HISTORICAL MARKER/LANDMARK; "The Cherokee Advocate" 1884. HISTORICAL MARKER/LANDMARK; 1885 OK's first telephone installed. OUTDOOR RECREATION; LAKE/RIVER/LAKE USE AREA; Follows beautiful Illinois River through upper NE OK. OUTDOOR RECREATION; LAKE/RIVER/LAKE USE AREA; Follows Illinois River & Lake Tenkiller through Cookson Hills. HISTORICAL MARKER/LANDMARK; 1844, 1st annual Indian Mission Conference of Methodist Church. 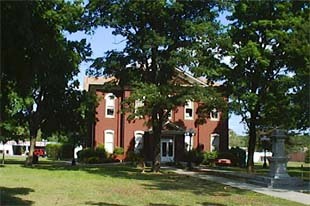 HISTORICAL MARKER/LANDMARK; PUBLIC RESTROOMS; HANDICAP ACCESS; PUBLIC TELEPHONE; c. 1889 Cherokee Nat'l Female Seminary. ·General Stan Watie Monument South of Tahlequah 2 miles at overlook on East side of Hwy. 62. MUSEUM/LIBRARY; SOUVENIRS; Old Cherokee capital; museum, gift shop. HISTORICAL MARKER/LANDMARK; NRHP Historical dramatic performances. ATTRACTION/ENTERTAINMENT; Recreated 17th-century Cherokee Village; seasonal. 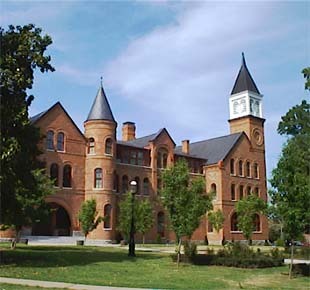 HISTORICAL MARKER/LANDMARK; SOUVENIRS; ATTRACTION/ENTERTAINMENT; PUBLIC RESTROOMS; Historic Cherokee courthouse. HISTORICAL MARKER/LANDMARK; Western Cherokee Capitol, 1829-39, named for Chief who settled Dwight Mission. MUSEUM/LIBRARY; SOUVENIRS; Houses Cherokee Gift Shop & Cherokee Museum. HISTORICAL MARKER/LANDMARK; Historic Cherokee Nation 19099-present called "glory of the Cherokees." OUTDOOR RECREATION; LAKE/RIVER/LAKE USE AREA; 20,800-acres on & around Kerr Reservoir; 7 days a week; year 'round.